Patio doors are an excellent addition to homes. They complete the look of your outdoor spaces and ensure protection all year long. With their large glass area, they can also bring the outdoors in. Renewal by Andersen®, the leading provider of patio doors in St. Louis, MO, explains this further. Patio doors can visually bridge the space from the inside to the outside. The wide expanse of glass that showcases the outdoors adds a feeling of extra space without requiring much changes. With the wide opening, patio doors also serve as a gateway for outdoor activities like hosting parties, playing sports, or gardening. Aside from the extra space, our patio doors can also help you save money. By letting in natural light and ventilation, they lessen your energy usage. In addition to its practical use, patio doors also improve your home’s appeal by allowing you to enjoy the outside view. To make the most of your investment, we recommend our sliding patio doors in St. Louis. They feature a narrow frame and a wide glass space, giving you a broader outside view. They also glide smoothly on a track, negating the need for extra space that a swinging door would require. Our contemporary gliding doors easily slides on our Andersen dual ball-bearing rollers that feature self-contained leveling adjusters. Their big entrance also provides a more seamless transition between your living spaces. You can also choose from various grille options. The reachout lock system ensures excellent security and weathertightness. Our patio doors also require minimal maintenance to keep their beauty. You can lift the doors easily from the track for a quick and hassle-free cleaning. 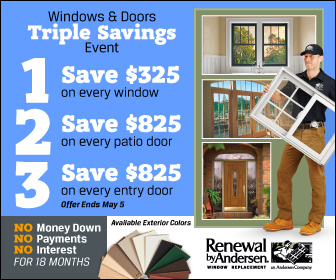 At Renewal by Andersen of St. Louis, we offer patio doors that last. Our selection of St. Louis French doors also provide superior performance and beauty for your homes. Rest assured that you’ll get an efficient and satisfactory installation. We even back our services with industry-leading warranties. For a quality patio door installation, call us today at (314) 332-2364. You can also fill out our contact form to request a free quote.